When you live in the country, you get an extra season between winter and spring. It's called Mud Season! 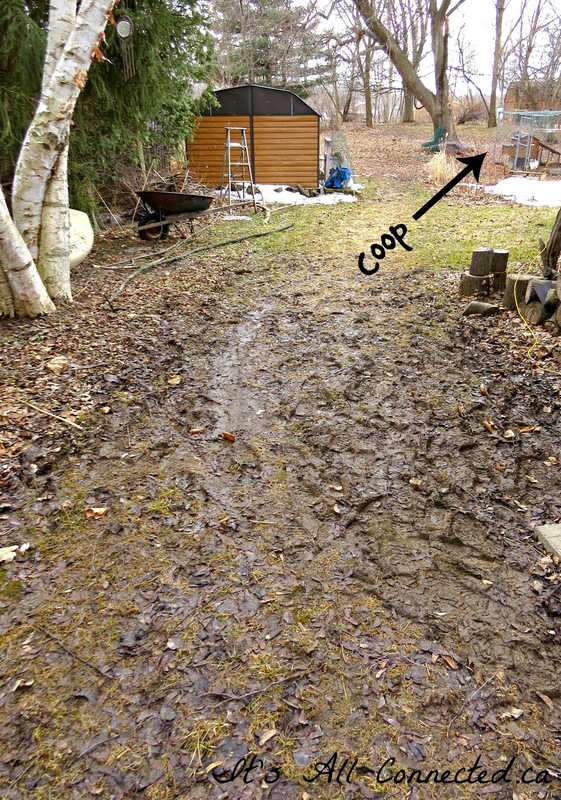 From the side door of my house to the chicken coop it is so deep in mud right now that I'm afraid I'm in one of those early western TV shows, where it seemed everyone fell into quicksand at some point in time. I wonder where all that quicksand went. It seemed such a regular thing in the old westerns and I've never seen any in real life. But, not even the sight of all that mess could stop my excitement when a neighbour called and told me to check out the river. Whole trees and debris of every kind swirled in the raging water. Several docks floated down from upriver. I've seen some very odd things go floating by on the ice flows at this time of year; toilets, lawn chairs and even a dead sheep once. 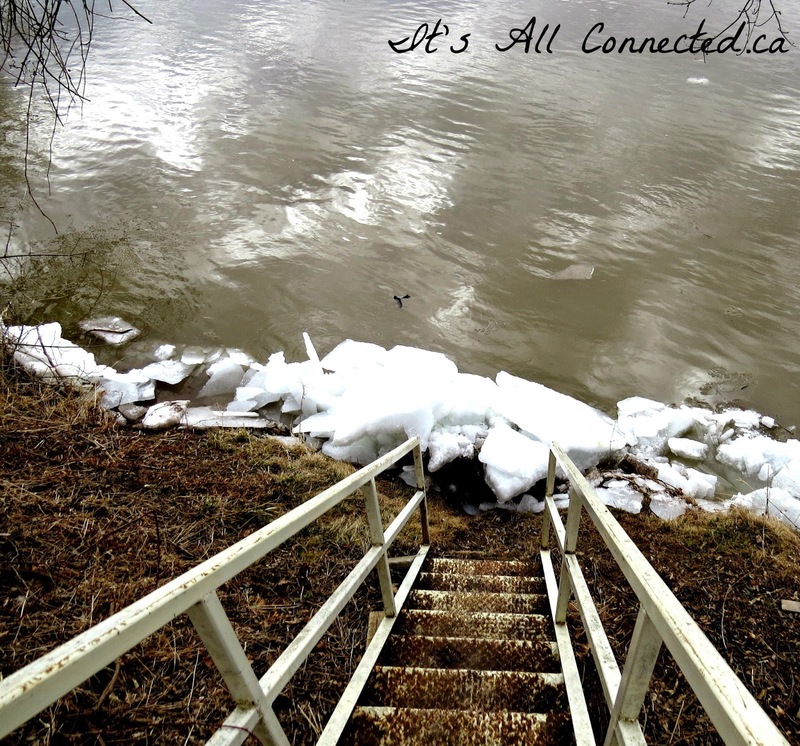 Just before it hits my flights of metal stairs, the ice turns away and I'm left unscathed for another year. Yay! 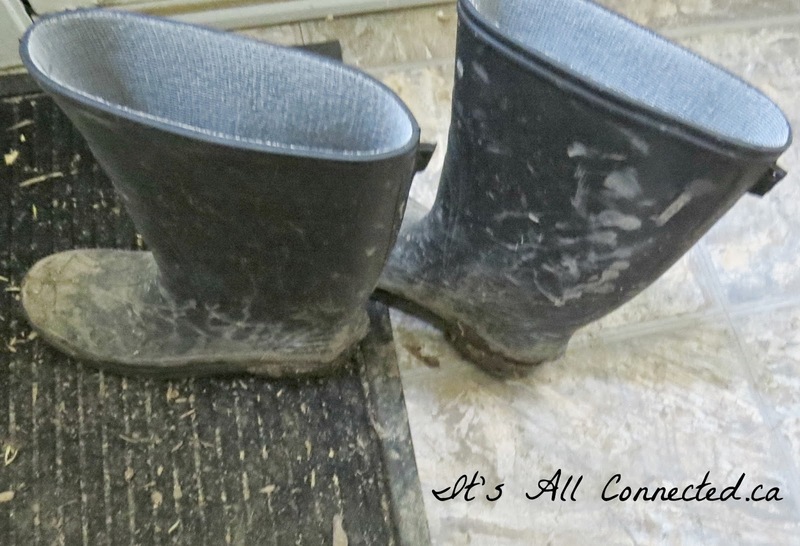 Even mud season won't dampen my spirits today, because I know spring is following close on it's heels! You certainly are well into spring and mud season there. I have a pair of those glamorous boots too and they really come in handy this time of the year (when the snow is gone as it's not started to go here yet). They sell some really pretty ones these days but to wear to the chicken coop and in the mud I think I'd stick to the old rubber ones. :) Glad the river has passed you by well away from your house! I remember watching the bottom half of our stairs go floating down that river, lol. We kept saying it was like watching a National Geographic show,...awesome is the perfect word for it. I am also sporting those same boots in that same condition, lol. For once I'm just happy it stopped snowing. how are those chickens doing, now that the river has broken up? I have some flowers poking through - Yeah! I too love the look of my boots, especially when wearing shorts in the summer. It's the village look. I guess mud is better than knee-deep ice and snow. Hope your chickens are happy to finally see the ground again. Maybe your Spring will be beautiful. We seem to have had three seasons only, summer, the rainy season and then a mud season, winter seems to have completely deserted us. It's great not to have been too cold but the warm weather we're having now makes for a long working day at the café ! 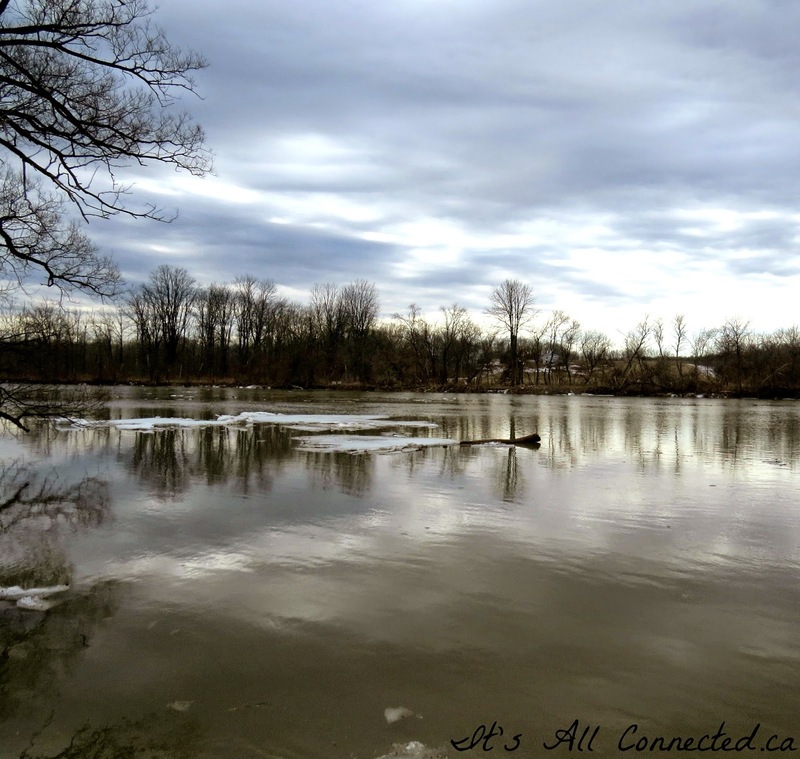 Love your beautiful shots of the river. Oh... the river is sooo beautiful! We're half way between snow season and mud season, but we're inching closer to an actual spring so we're happy. 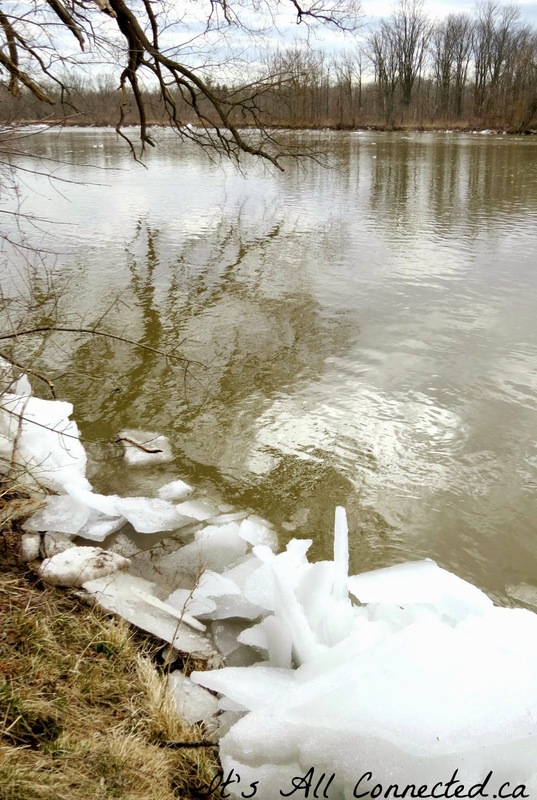 Even though we're impatient for warmer weather we know that a slow melt is best so there's no flooding or ice dams. We still have snowbanks in the yard that will take a while to disappear. I need some of those mud boots! My entire yard is mud. It's a good thing we no absolutely nothing about putting in a lawn. I love that the river is right behind you! And it's April. I'm glad you're finally thawing out (us too! ).